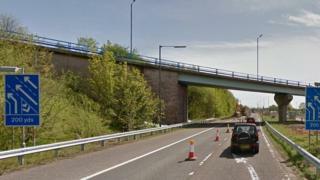 A man has died after he was hit by two cars on the M61 motorway in Salford. Police said they received reports at 02:05 BST that a Volkswagen struck a pedestrian on the southbound section before a Toyota hit him seconds later. The man was pronounced dead at the scene, near the link to the A580 East Lancashire Road. The drivers of both cars stopped at the scene and have spoken to officers. Police said no arrests have been made and the case was "extremely complex". PC Paul Shore, from Greater Manchester Police, appealed for witnesses, saying: "While we do not yet know the identity of the man who tragically died at the scene, we are ensuring our inquiries are carried out quickly and sensitively in order to inform his family at the earliest opportunity."